Picking the right fat reduction method can be a difficult choice. Lately, we’ve seen some new treatments come out that add to the list of choices. That’s actually a good thing, but it does complicate your choice a bit. Have no fear, because we’re going to tell everything you need to know about the different types of fat reduction treatment. By the end of this post, you should have a good idea of which treatment is right for you. Fat reduction treatments are generally placed within two categories: surgical and noninvasive fat reduction treatments. The surgical option that you’re probably familiar with is liposuction. It has been, and continues to be, the most popular option for reducing fat. A certified cosmetic surgeon will carefully remove the fat through a very small tube during the procedure. Suction through the tube, called a cannula, removes fat cells, sculpting the patient’s body. The patient is usually under general anesthetic during the procedure. 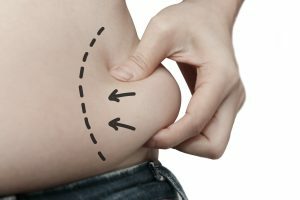 Despite what you may have heard, liposuction isn’t a treatment for obesity. The procedure does remove fat cells, but it isn’t a cure-all. That’s because the amount of fat that can be removed is limited. And if the patient lives an unhealthy lifestyle afterward, the remaining fat cells can grow larger. There are also risks for lumpiness or indents in the skin if too much is removed. That’s part of the reason that liposuction isn’t used to treat obesity. Despite all this, there are many reasons that people choose liposuction for their fat reduction needs. It’s invasive. That’s actually what makes it so successful. Noninvasive treatments can’t remove fat as quickly or to the extent that liposuction does. However, this comes with some consequences. For starters, the recovery period is much longer–up to six weeks. There will also likely be bruising, swelling, and soreness for anywhere up to ten days after the procedure. So you’ll have to ease back on your daily routine during that time. Though that is to be expected from a surgery that’s literally removing something from your body. Results are quick, but the full effect may take longer. You’ll see results after the swelling goes down. But you won’t see the final results for about 6 months. You will see a certain amount of skin reduction, as well. After the surgery, you’ll be given support bandages to wear on the affected areas. This will help your figure maintain the shape you’re looking for. Liposuction works best for fat reduction in the abdomen, legs, arms, neck, and back. The results will typically be more dramatic than other procedures. Liposuction is a surgical procedure, so you should give it a good deal of thought before committing. Talk with your doctor to learn whether or not you’re a good candidate. There are several different noninvasive treatments, but they generally revolve around heating or cooling fat cells. This, in turn, kills the cells, and then the patient waits for them to exit the body naturally. CoolSculpting and other “freeze” treatments cool the fat cells until they die. This doesn’t affect the surrounding tissue, however. It also doesn’t cause pain, and you won’t experience any downtime, as you would with liposuction. Generally, the final results aren’t seen for three months. But you may see initial results in as little as three weeks. Similar to the cooling treatments, these use radio frequency technology to target fat cells and kill them. These treatments heat the fat cells to kill and dissolve them. It’s generally painless and there is no downtime. TruSculpt is one of the popular forms of this treatment that you may have heard about. It will likely take about three treatments before most patients start to see the results they want. Verju is another cooling treatment, but it works by shrinking the fat cells, not killing them. The treatment flushes the fatty lipids out of the fat cell, then the body rids itself of the lipids naturally by turning them into energy. Verju only shrinks existing fat cells, rather than harming them. Results are usually seen within as little as two weeks. Because they’re noninvasive, the results won’t be as dramatic as liposuction. That means that these procedures work best for eliminating stubborn areas of fat. It’s best if the patient is fairly happy with their current weight, but wants to lose that last bit of fat. The noninvasive nature also means that there is much less downtime. With treatments like Verju, there is no downtime. Patients can go about their daily life as they were before treatment. Results may take longer to see, but that’s to be expected. Liposuction physically removes fat from your body. Noninvasive treatments work through a slower, albeit effective, process. Patients should not expect to see the massive fat reduction of liposuction. A 25% reduction in fat in an area is a more realistic goal. It really depends on how you look and feel right now. If you need to lose large deposits of fat or want to dramatically improve your overall figure, then you might want to choose liposuction. On the other hand, maybe you’re pretty happy with the way you look. You’ve been working out and eating healthy, but you still have stubborn fat deposits. These often are found in the abdomen, hips, or thighs. If that’s the case, then a noninvasive treatment might make more sense for you. If you’ve made your decision, then congratulations, you’re ready to start looking and feeling your best! If you think a noninvasive procedure is right for you, then contact Erchonia today. Our Verju treatment is perfect for anyone looking for a noninvasive and easy way to reduce fat. Call today or find a provider near you! This entry was posted in Informational, News, Weight Loss. Bookmark the permalink.